Morton County Sheriff’s Department officers together with the National Guard began firing less-than-lethal projectiles, pepper spray, and, reportedly, mace on a group of water protectors at Standing Rock during what was supposed to be a prayerful, peaceful walk to the drill pad where work is rumored to continue on the Dakota Access Pipeline. And all of this, of course, happens on the holiday honoring Dr. Martin Luther King, Jr. — who dedicated his life to non-violence to spark drastic change on the issue of civil rights. Around 200 water protectors eventually grouped at the site of the drill pad, and three were arrested — accused of trespassing after cutting a razor wire fence and then allegedly tampering with industrial lighting. As the crowd verbally taunted militarized police sporting riot shields and military gear, the situation Monday quickly tensed, and police began spraying people with mace. Soon after, as some water protectors sang and prayed, police fired rubber bullets at a few individuals, who then had to be transported away from the scene for medical assistance. Reports from people at the camps indicated police brought in vehicles with water cannons just beyond the scene. 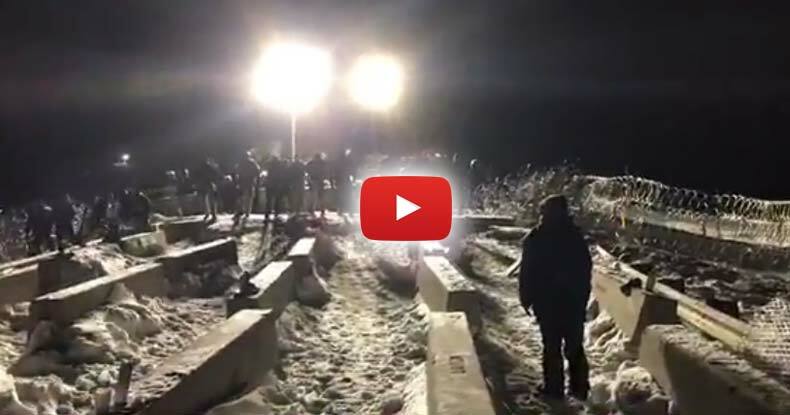 In the video below, we can also see police open fire on water protectors with rubber bullets in their backs as they are running away from the tear gas. Water protectors also gathered at Highway 1806’s Backwater Bridge, where a blockade of cement barriers, burned out vehicles, and razor wire remains in place after a confrontation in the autumn. In fact, that site has seen several confrontations between water protectors and police from multiple states led by the Morton County Sheriff’s Department over several months — the worst occurring on the night of November 20 when less-than-lethal rounds, tear gas, and water cannons were employed to allegedly control the crowd. Hundreds were injured and dozens had to be treated for hypothermia when law enforcement sprayed protectors with pressurized water in sub-freezing temperatures. Police claimed protectors acted violently against them and set several fires which blazed out of control — but video showed the pipeline opposition group defending against the onslaught of force, mainly hurling tear gas canisters back at police. Monday night’s showdown between National Guard-reinforced law enforcement and completely peaceful water protectors at first seemed it would devolved into a similarly unjustified use of force, but — though many were maced and a few shot with projectiles — the situation did not spiral completely out of control. Before night fell on the camps near Cannon Ball, North Dakota, activists filmed and photographed a surface-to-air missile system brought by law enforcement to the area near pipeline opposition camps — allegedly in place to shoot down any drones flown above the scene. Despite evacuation and emergency orders in place in the area, water protectors remain encamped near the banks of the Missouri River in protest against completion of the Dakota Access Pipeline. A fracture also occurred after Standing Rock Sioux Tribe Chairman Dave Archambault II asked those unprepared to endure the harsh winter on the open plains to vacate the camps. Additionally, Oceti Sakowin — now the primary and largest camp — lies in the river’s floodplain and, as snow thaws, will eventually be submerged. Water protectors have vowed to remain at the location until construction of Dakota Access is permanently halted — but considering the incoming administration of President-elect Donald Trump has openly courted Big Oil, it appears unlikely the effort will see its dream of protecting the drinking water source of some 18 million people and the Standing Rock Sioux tribe will come to fruition. Law enforcement did not respond to multiple requests for comment on the events of Monday night.